Updated Saturday January 9, 2016 by Denis Archambault. From QEW: QEW to Brant St. (exit 101). North on Brant to Mount Forest Drive. East (right) on Mount Forest to Mountainside Arena. From Hwy-403 Northbound: North on Hwy-403 to QEW North. North on QEW to Brant St. exit 101. West on Brant to Mount Forest Drive. 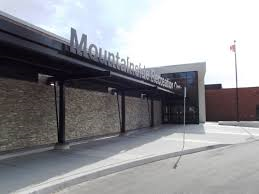 North (right) on Mount Forest to Mountainside Arena.